A few weeks ago I got a very special bright green package in the mail. A few members of the Ryobi One+ family have joined the Fynes family. Since then I’ve literally been like a kid with a new toy! 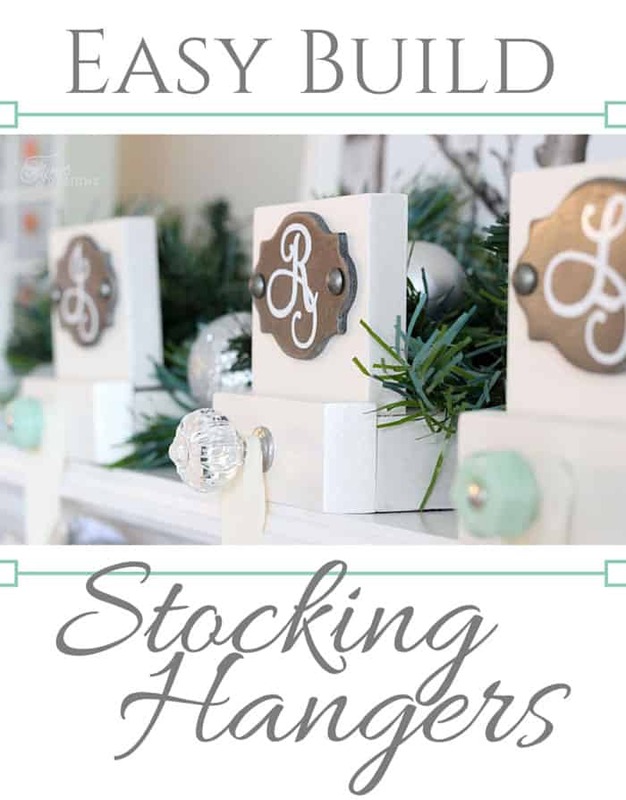 The first project on my to-do list is a fun set of DIY Stocking hangers. To get my new woodcrafting hobby underway I thought I should start small. I’ve had these photo stocking hangers from Shanty to Chic and these ones from SugarBee Crafts in my Pinterest Build it board for some time. I love the basic design of them but needed to give them a little Fynes touch. The special touch was most definitely these beautiful cabinet knobs I found at D.Lawless Hardware. 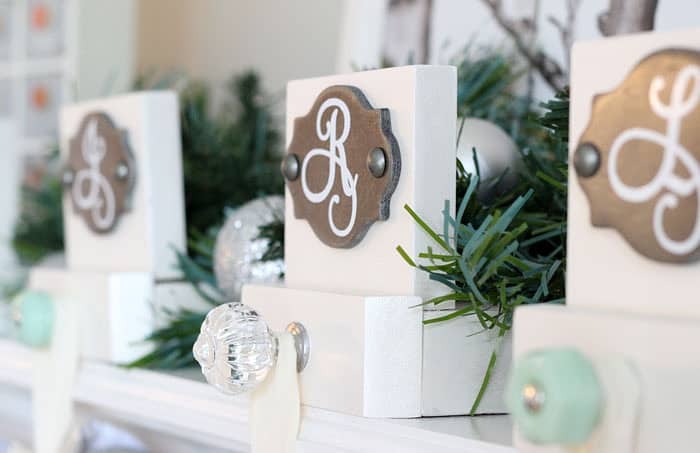 (they have an awesome selection of stunning glass knobs at amazing prices, a must checkout site) The knobs are so pretty, I knew I had to find a way to incorporate them into our Christmas decorations. 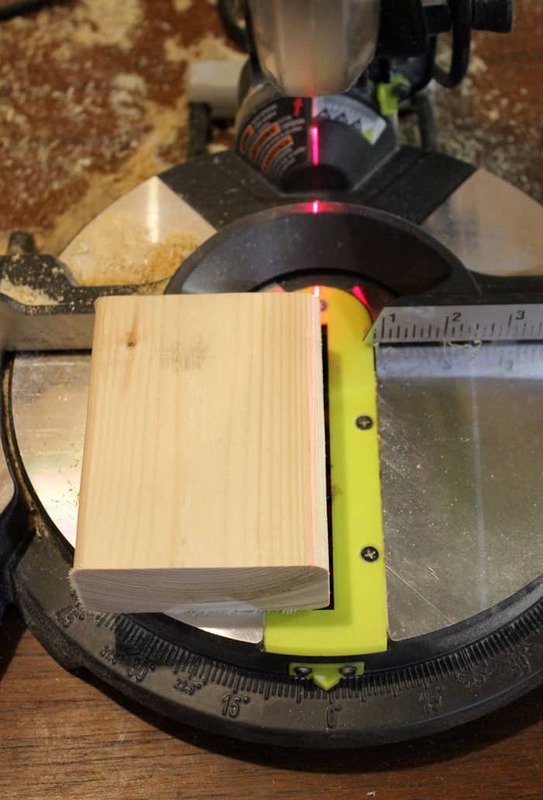 Using the Mitre Saw cut the wood pieces to size according to the above photo. 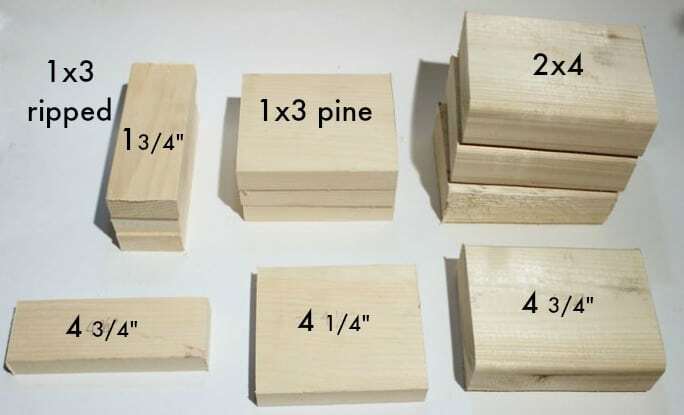 2×4– 4 3/4″, 1×3– 4 1/4″, rip two pieces of the 1×3 giving you 1 3/4″. Cut the edge of the 2×4 pieces off to make it have square edges. 3. Mitre the edges of the smallest pine pieces at a 22.5 degree cut. Sand all edges smooth. I like to paint my pieces of wood before I assemble, then just touch up when it is put together, but that is totally up to you. 4. 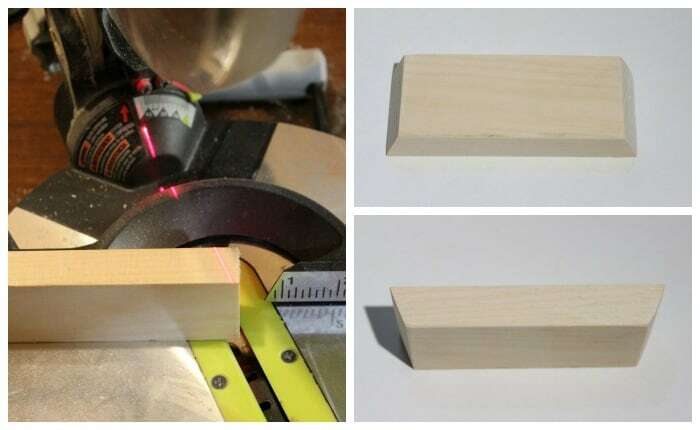 Apply a bead of wood glue to the bottom edge of the 1×3 block. Using the brad nailer and the 2″ nails attach the 1×3 block to the top of the 2×4 lining up with the squared edge. Nail from the bottom side up. 5. Line the small front piece up to the 2×4 block. 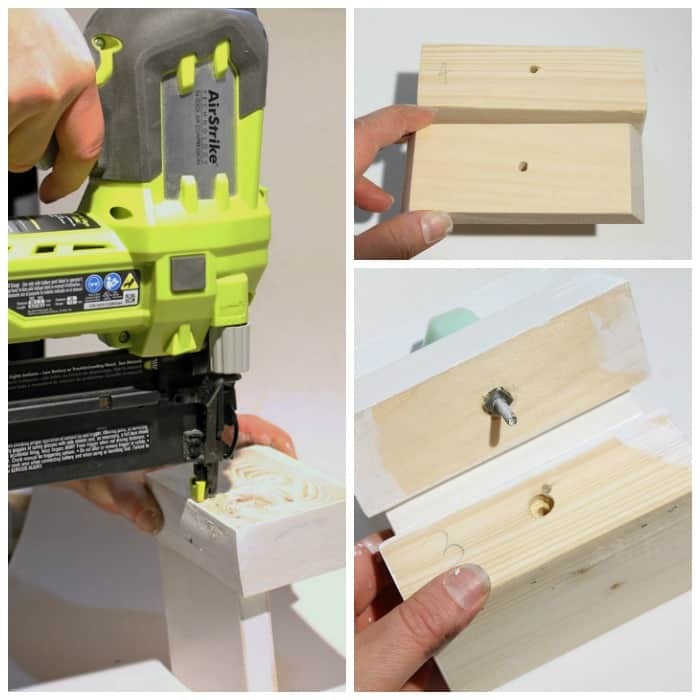 Drill a small hole into both blocks for the cabinet knob. (You can see I numbered both wood blocks to make sure my pieces lined up after painting) Countersink a hole in the 2×4 for the knob screw to fit into flush. 6. 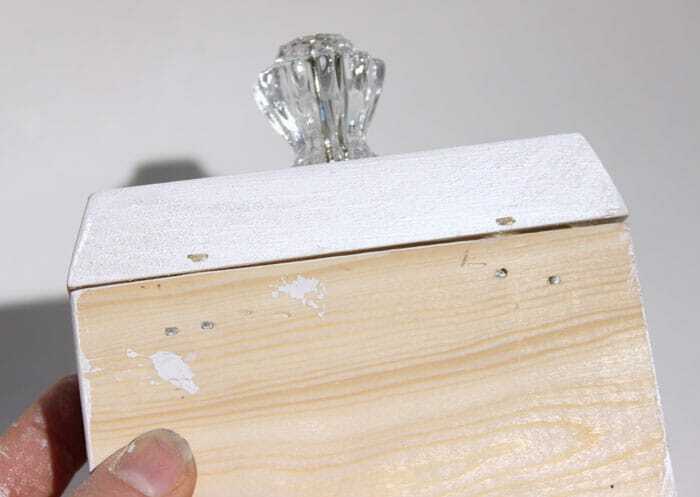 Apply wood glue to the front panel, and press onto to the front of the stocking hanger. From the bottom edge using 1 1/4″ nails toe-nail into the front plate into the 2×4. 7. 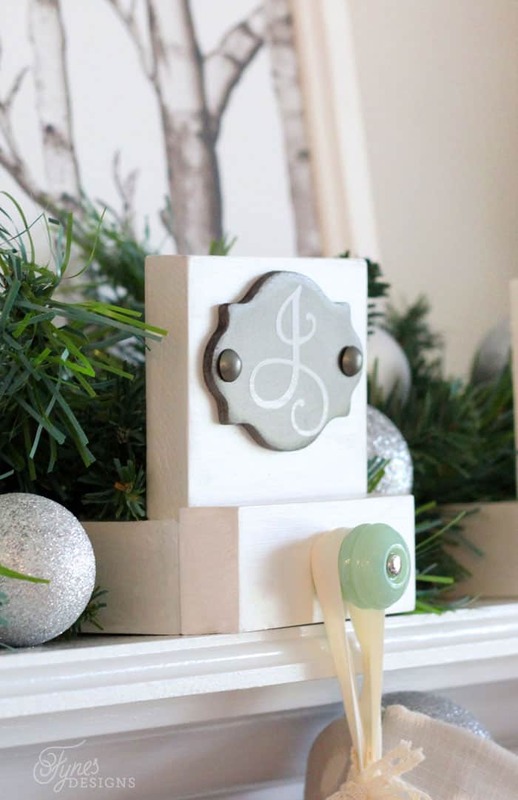 Last step is to personalize your stocking hangers. I found these small chalkboard plaques at Michaels in the impulse items. They had a clothes pin on the back, so I just snapped that off. I attached the plaque with a dab of wood glue and two furniture nails, then applied a vinyl monogram I cut out on the Silhouette. I’m so happy with how they turned out. I painted them with a Martha Stewart white pearl craft paint. I wish a photo would capture the sheen of the paint. I love the variety of pulls I used, each one is beautiful. Be sure to check out the amazing selection at D. Lawless Hardware. I’m really amazed at the amount you can build with just a few handy tools. I can’t wait to show you the other fun stuff I have up my sleeve! So what do you think, is this a DIY woodcrafting project you think you could handle? Beautiful and especially useful for people like me who don’t have a fireplace! these turned out AMAZING – great job! Gorgeous! Congrats on your new power tools (drool), and you did such a great job with this project. 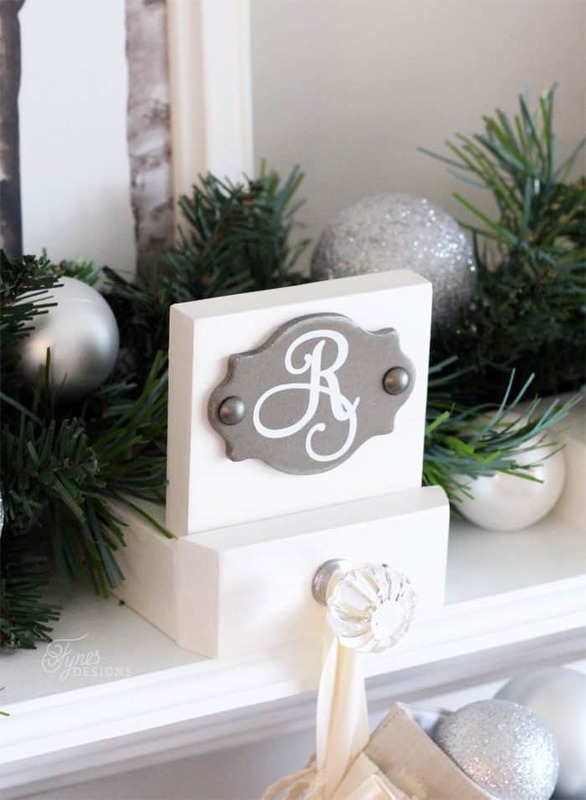 The knobs are the perfect touch, and I love the monogram plaques. These are so gorgeous Virginia!! I love, love glass knobs and they look perfect on there! (Did you find that Lawless hardware was expensive or ship to Canada?) Someone recommended it to me when I was looking for some and the shopping was more than the knobs! Just wonder how you found it? Have a great day, friend! A great project, and certainly one that I might attempt for next Christmas – better start in July though if this year’s anything to go by!!! Hi! These are beautiful! Did you paint the letters on the front or did you use vinyl? If you painted them….WOW!!! If you used vinyl, would you mind sharing the name of the font? Hi Kelly, I used vinyl, sorry I can’t remember the font. I did however change them this year to a script font with our whole name using Octavia. Merry Christmas! This are just beautiful! I love them! Did these handle to weight of the stocking when it has items in it as well ? Hi, if I had a filled Christmas stocking hanging from this, would it fall forward? If not what keeps it from falling off? These are more for hanging decorative stockings until St. Nick arrives. you could use a command hook to keep in place.